Today's post isn't about a weird species, but rather about a strange trait of an animal most of us are familiar with, the hooded seal. Have you ever wondered why they are called this way? And what is the bizarre balloon-like thingie depicted on the image above? Let's find out ! Why are they named this way? 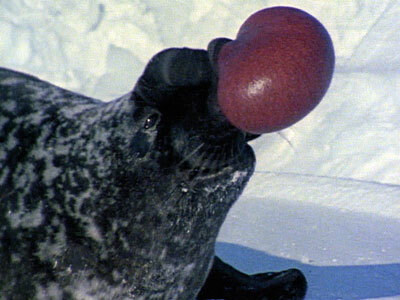 Hooded seals take their name after the distinctive inflatable "hood" that males have on the top of their heads. Similarly, the generic, greek-derived name "Cystophora" translates to "bladder-bearer", again a reference to the species' peculiar inflatable bladder. The hood appears only in males and begins to develop at the age of around 4 years. It continues to grow over time, reaching its maximum size at about the age of 12. When inflated, it looks like a large pink balloon. The balloon is essentially a membrane. To inflate it, males shut one of their nostril valves, and push the air inside the membrane, which is rooted on the other nostril. The membrane then inflates and protrudes from the open nostril. An average-sized hood is two times bigger than a football and has a volume of 6.3 liters. When the sac is deflated it just hangs from the upper lip. Males inflate their red, balloon-like nasal septum for numerous reasons. During the breeding season, they use the balloons to impress females and to assert their dominance over other competing males. The rules are simple and straight forward. The male with the biggest balloon wins. Surely, a strange way to demonstrate manliness! On the rare occasion that two male seals measure equally, they resort to a duel. Males also inflate their hood when they are threatened or excited. Finally, males sometimes blow the balloons when they are just lying around. Scientists think that they do this just for the heck it! Jump to 00:33 if you can't wait for the balloon!